In a week when we lost Fr. 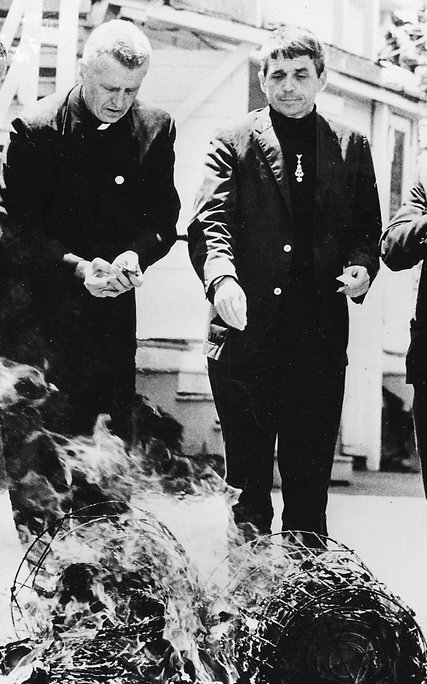 Daniel Berrigan of the Catonsville Nine, more conflagration. The morning after a not-so-Super Tuesday with only one measly primary (I don’t mean Indiana is measly, I mean a single primary does not a Super Tuesday make), everyone woke up at the bottom of the rabbit hole with a big “eat me” note signed by Donald Trump. #ICYMI Donald Trump won the Indiana primary yesterday after, based on a National Enquirer report casting Ted Cruz’s father, Rafael, as a kind of Zelig/Forrest Gump character allegedly seen close to Lee Harvey Oswald in a photo. N.B. Lee Harvey Oswald was the purported “single actor” in the assassination of President John F. Kennedy. Prior to 11/22/63 Oswald spent some time working for the “Fair Play for Cuba” coalition in New Orleans and hung with some Cuban refugees at the time. Outrageous as the story appeared, not to mention the absurdity of a presidential candidate citing the National Enquirer as a source, it not only dominated the news all day yesterday but also served its purpose in that Cruz swallowed the bait and addressed it in a news conference rather than brushing it off as farce. In the wake of his resounding loss in Indiana last night, and, some speculate, the shady attack on his father, Cruz suspended his campaign leaving Trump as the presumptive GOP nominee. Then came the dawn … and the inferno. A number of disappointed Republicans have torched their voter cards and declared support for the #nevertrump campaign after the billionaire businessman clinched the party nomination following Ted Cruz’s resignation. Such is the resentment towards Trump, many are now readying themselves to vote for the Democrats despite being lifelong Republican supporters. Photographs of them burning their voter registration cards have appeared on social media, while others Breaking newssay they are prepared to vote for Hillary Clinton. Until a short while ago, the Mathematical Impossibles, Bernie Sanders (who won Indiana by a small margin but has a snowball’s chance in a bonfire of being nominated) and John Kasich (who won a single primary – in his own state of Ohio) remained. Breaking news is that Kasich will hold a presser from Columbus, OH at 5 pm EDT and will also sing his swan song. In other news, the New York Times reported yesterday on our first U.S. climate refugees in Louisiana having to evacuate their ancestral home for higher ground – or rather – for ground – as their island is slowly being inundated. Today, the New York Times reports, an entire town in Alberta Canada is also under evacuation due to “apocalyptic” wildfires. Climate change disaster is already upon us. It is biblical. Floods and combustion abound and one viable candidate remaining has a plan for climate change and a long history of battling it. Hillary Clinton steadfastly maintains that she is not the one to tell Bernie Sanders to suspend his bid since she remained into June 2008. But, clearly, there are issues. Hillary is the candidate with the concrete, pragmatic plans. Even Republicans are flocking to her. John Kasich, saying his heart is not in this, is listening to his party leadership and exiting. Bernie Sanders, while he runs under the Democratic Party banner, should also withdraw at this point. It was never his party to begin with, and the stakes are too high for grandstanding. Disaffected Republicans are not feeling the Bern. They are burning their Republican registration cards and grabbing the one sensible hashtag: #ImWithHer. Hillary is the revolution. Bernie is too myopic to see it. He should do his part in the #NeverTrump movement and move aside so that Hillary Clinton can adjust her focus to the real threat: A Trump White House. Yesterday in Wisconsin, Hillary Clinton participated in a forum on gun violence in Milwaukee, rallied voters in La Crosse, toured a technical college, and visited a brewery, also in La Crosse. Hillary never forgets the people who labor unseen to make our days safe and comfortable – that includes those keeping “Happy Hour” happy. From there, Hillary hit the trail again, this time back home to New York for what we are certain will be a rousing homecoming rally this morning at the legendary Apollo Theater on 125th Street in Harlem. Hillary Clinton Campaign Event in Harlem, New York Democratic presidential candidate Hillary Clinton speaks at a campaign event in Harlem about a variety of topics, including income inequality and national security. New York’s presidential primary will be held on April 19. Hillary’s event schedules, not to mention her four years of daily schedules as secretary of state, fly in the face of a fairy tale one of the three Republican candidates has repeatedly tried to spin that Hillary lacks the stamina required of a POTUS. These attempts have met with the same failure as his efforts to spark chants of “USA” at his campaign rallies. That same chant has erupted spontaneously and enthusiastically recently at Hillary’s speeches after victories in FL, NC, and AZ without Hillary’s prompting. The same Republican front-runner, who boasts of the strength to take out ISIS, whines perpetually about Megyn Kelly bullying him and says his campaign manager was rightfully protecting him from an assault by Michelle Fields, formerly of Breitbart. Last night, all three remaining Republican candidates rescinded their loyalty pledges to support their party’s nominee. Let’s remember that these three folks expect Americans to put them on a podium on the Capitol steps to take the oath of office! How good is their word? Any of them? Bernie Sanders also has recently waffled on whether he would support a Hillary Clinton candidacy. CHUCK TODD: Is there conditions for you to support her? BERNIE SANDERS: Right now, I am running to become President of the United States and I hope very much, Chuck, that you will be asking her that question. CHUCK TODD: I understand that and I will the next time I have her. But are there conditions for your support of her if she’s the nominee. BERNIE SANDERS: Look, it’s too early to talk about that. Right now, we have a lot of momentum. We’re focusing on Wisconsin, New York State. We have a path to victory. We are going to win this nomination process. We can point to verifiable evidence of Hillary’s trustworthiness on this and many issues. Hillary has always said she would back her party’s nominee, and has a history of having done so. She has never waffled. Let me share, with those of you who are new to Hillary this cycle, the email we received from her on June 27, 2008 after she suspended her campaign. On February 8, in Unity, New Hampshire, 107 people voted for me, and 107 people voted for Senator Barack Obama. Today, Barack and I were in Unity to celebrate a unified Democratic Party focused on electing him the next president. I was proud to stand with him today, and I will do whatever I can to help his campaign between now and November. Senator McCain and the Republicans may have hoped that we wouldn’t join forces like this. They may have wished that we wouldn’t stand united to fight this battle with everything we’ve got. But I’ve got news for them: We are one party; we are one America; and we are not going to rest until we take back our country and put it once again on the path to peace, prosperity, and progress in the 21st century. Click here to watch the video of today’s unity rally in Unity, NH. Immediately after this rally, Hillary hit the trail for the Obama/Biden ticket and campaigned her heart out. She lost some supporters along the way. Not all of the “Sisterhood of the Traveling Pantsuits” agreed with her wholehearted support of her former opponent, but I pointed out then and do again now, that Hillary Clinton is a woman of her word. Her plans are carefully crafted, intersectional, and pragmatic. She will not promise what she cannot deliver, but when she promises, you can count on her to deliver. On that note, Hillary is the one making the policy speeches on specific issues and policy plans while the other remaining four give boilerplate stump speeches. There is a difference between a policy speech and a stump speech. Hillary’s speech on the subject of the Supreme Court this week is but one example. Please feel free to share this with those less familiar with Hillary Clinton than we are.